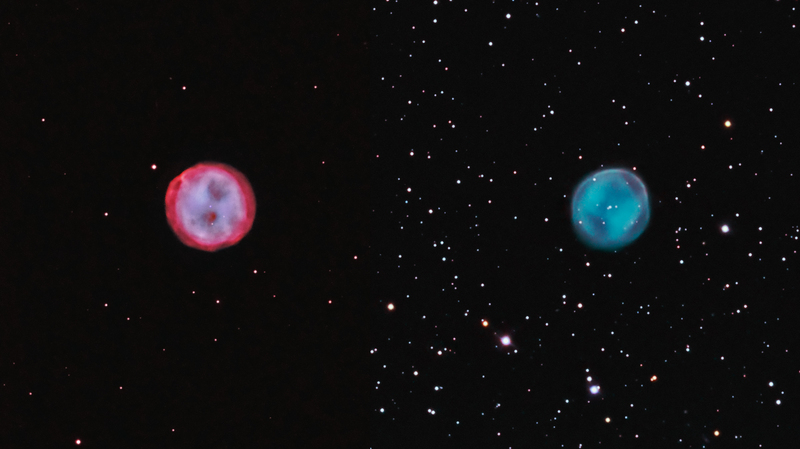 This is a unique comparison of two planetary nebulae, both referred to as the Owl Nebula. Left Image – North: Messier 97 (NGC 3587) is a magnitude 10 planetary nebula in Ursa Major at RA 11h 14m 52s and DEC +55d 01h 15s. It was taken with a 16" f/8.9 RCOS RC telescope having a focal length of 3550 mm and an Apogee U16M (KAF16803) CCD camera using 3 nm Astrodon H-a, NII and OIII narrowband filters. Natural color was produced by mapping both the H-a and NII data to red/magenta and OIII to blue = green. The image scale was reduced to match that of the Southern Owl described below. Taken from Sierra-Remote Observatories, Shaver Lake, CA south of Yosemite. Right Image – South: (PLN 283+25.1, K1-22 ) is a magnitude 12 planetary nebula (PN) about 2′ apparent diameter in the constellation of Hydra at RA 11h 26m 42s and DEC -34d 22m 00s. 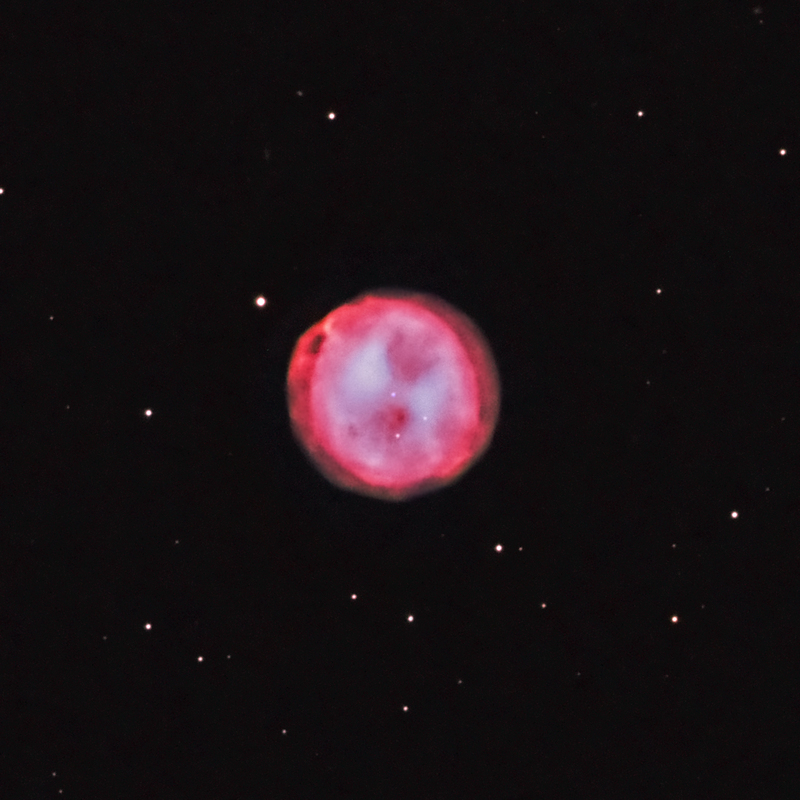 It is referred to as the "Southern Owl Nebula". It was taken with a 14.5" RCOS Classical Cassegrain telescope having a focal length of 3000 mm and an Apogee U16M CCD camera. It was taken with Astrodon 5 nm H-a mapped to red/magenta and 3 nm OIII mapped to blue = green. Additional information may be found in my image here. The stars are brighter because RGB data were blended into the image. Taken at Riverland Dingo Observatories, Moorook, S. Australia. They are similar in size and nearly circular, which is likely why the the PLN object was given the Southern Owl name. However, as expected, the similarities end there, with significant structural differences between the two.